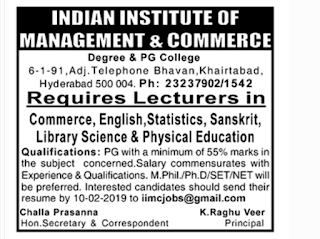 Indian Institute of Management and Commerce,Khairtabad, Hyderabad has advertised for the recruitment of Teaching Faculty-Lecturers,jobs vacancies. 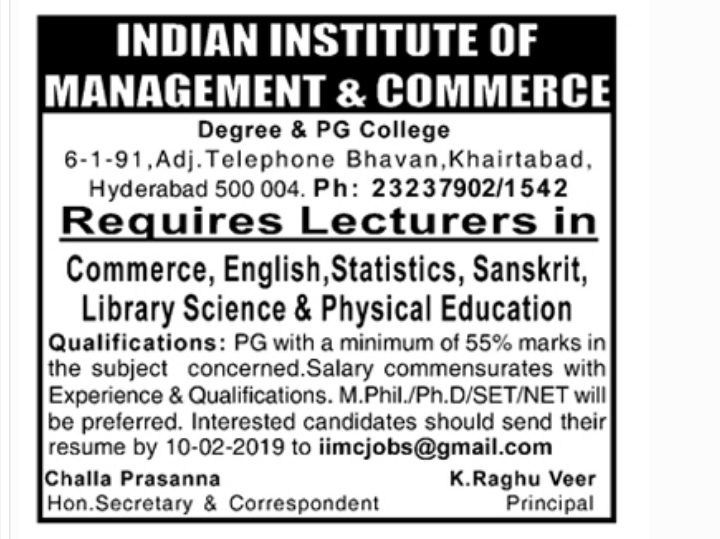 Interested and eligible job aspirants are requested to send their resume by 10-02-2019.Check out further more details below. About College: The Indian Institute of Management and Commerce(IIMC) established four decades ago(year 1973) has to its credit some outstanding achievements in the field of Commerce Education in general and Honours course in particular at the Degree level. Eminent social workers and philanthropists and Educationalists like Sri Kothuru Seethaiah Gupta, Sri Challa Som Raj Ram, Sri C.E. Gupta, Sri Dundoo Balanarasaiah, Sri Narayana Chetty IAS(Retd. ), Late Sri Veloor Lingaiah Gupta gathered together and laid solid foundation in starting this premier Institution. Members of Vysya Community in particular and admirers of Higher Education in general are greatly beholden to the Founders. PG with minimum of 55% marks in the subject concerned. Salary Package: Salary commensurates with qualification and experience. How to Apply: Interested and Eligible candidates should send their resume by 10.02.2019.